The three cent coin has an unusual history. It was proposed in 1851 both as a result of the decrease in postage rates from five cents to three and to answer the need for a small-denomination, easy-to-handle coin. It was minted from 1851 to 1873 at the Philadelphia Mint. In the later years there were very small mintages and the 1873 issue was in proof state only. However, an earlier date silver three cent piece can be bought in worn condition for a relatively low price. 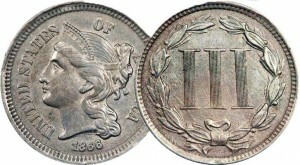 The silver three cent piece (along with the silver dollar, the half dime, and the two cent piece) was discontinued by the Coinage Act of 1873. This coin was composed of copper and nickel and was larger than the silver coin of the same denomination. The coin featured a Liberty head obverse and another Roman numeral ‘III’ reverse. The three cent nickel was never intended as a permanent issue, only as stopgap measure until the wartime hoarding ceased. However, production of the coin continued until 1889. The three cent nickel was only minted in Philadelphia and, except for a larger date on the 1889 pieces, had no design differences throughout its run. Over the course of the series mintage declined, and some of the dates are scarce. But, with an 1865 mintage of over eleven million, a type piece can be inexpensively obtained.